From Nashua to Boston and all adjoining counties / surrounding area and any exotic paradise. Reward or gift. If unable to find lost item there is a $25 gas fee for up to 30 miles. Thereafter the fee is .50 a mile. Snow banks, water, fields, yards, and most any place that's safe. I got my first detector in 1995, but have 4 years total of active detecting. I grew up in a family owned Pharmacy down in Texas, graduated from Texas State University in 1986, and now run a Precor fitness store in Nashua NH. Work is work, but helping others is fun! I got a call from a young man who lost his ring while swimming and swinging on a rope swing. So 50 beer caps later I found his ring. Sometimes you have to remove hundreds of bad targets to find the precious item! Guy Fuller is the hero of the day, at least to me. My parents married in October of 1959. Not only were they husband and wife, they were best friends. I am the youngest of five children and couldn't ask for better parents. I lost my Mom in September of 2008, and my Dad in February of 2016. 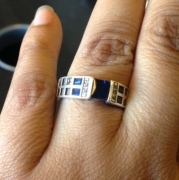 As promised, I was given the engagement and wedding rings. These became my most prized possessions. 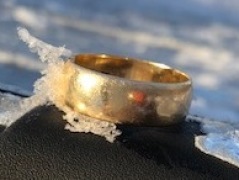 Well, yesterday afternoon - Christmas of all days - I had lost my Dad's ring while using a roof rake to remove snow from my roof. I frantically searched through the snow (with tears running down my face) until it was to dark to see. I began searching the internet for a place to rent a metal detector and even looked into buying one just to find the ring. I came across TheRingFinders.com and found Mr. Fuller, who was fairly close. I immediately sent him an e-mail explaining what happened and left my phone number. I didn't want to call since it was Christmas after all. He called me that night and said he could probably come up in the morning to help and he did. After some detecting, we marked a couple of spots and he asked me to go get some hot water to melt some of the snow. I went in, got some water and by the time I stepped back outside he said "you can put that down." As I walked over to him and looked down, there was the ring. I picked it up, and the water works started again. I gave him a hug and just couldn't thank him enough. You have no idea what these rings mean to me. I can't tell you how grateful I am for this site and especially for Guy Fuller for finding my Dad's ring!! Thank you, thank you, thank you soooo much!!!! I am so grateful to Guy and The Ring Finders! They made a pretty crappy week end on a great note. I lost my engagement ring playing in the yard with my dog and after panicking, my fiancée, myself, some of the wedding party and three neighbors searched in our yard. After seven hours and a metal detector rental and not enough luck, we turned to the internet and found Guy here on The Ring Finders. Skeptical at first, because I didn’t think there was even anyone in the world who would do this, let alone on a reward basis and not for a really high fee, I gave Guy a call and after some brief chatting and scheduling, I got to meet him and he got to work. After his first initial run through of the yard he assured me it was close that he could find my ring. A day or so later he came back when I was available for more time he gave the yard an extremely through sweep, and then the neighboring yard a through sweep as well. When the ring didn’t turn up in my yard, my first though was “we’ll never find is” and Guy assured me again we would and I wouldn’t be writing this if he hadn’t, and I am so grateful that he did. My ring had made it over the fence into the yard next door, and was safely recovered from under a pile of leaves. Guy is a funny, easy going person and his genuinely nice persona kept the whole experience enjoyable despite the circumstances. That fact that he does this just for the love of helping people, and that he helped me, makes me glad such a site like this, and people like him that do this, exist. Thank you Guy for doing this, and thank you TheRingFinders for making a place that people like me can find people like Guy.